This epic African adventure engages the whole herd. 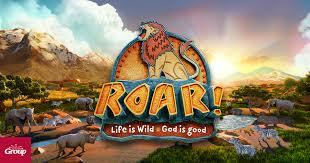 At Roar Vacation Bible School (VBS), held June 24-28 from 6:00-8:30 PM, kids grade K through 5 explore God’s goodness and celebrate a ferocious faith that powers them through this wild life. They participate in memorable Bible-learning activities, sing catchy songs, play teamwork-building games, make and devour yummy treats, experience one-of-a-kind Bible adventures, and collect Bible Memory Buddies to remind them of God’s love. We will also have a limited-space preschool program for children ages 3-5. Children must be potty-trained. To register, fill the form below and email it to Elizabeth Wilson.